The end of the end is near for the famed Avro Vulcan Bomber “XH558.” The aircraft has been flying in private hands and with private funding since 2007, an amazing feat to say the least. 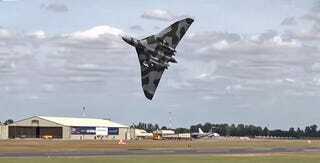 Now, after flying more hours than any other Vulcan, this will be her last air show season. Crews are pushing XH558 to her max for crowds at the Royal International Air Tattoo in RAF Fairford, UK, one of the world’s largest air shows. On takeoff yesterday, the massive delta-winged beast rolled hard to the right just above the runway. The maneuver, which was lower and steeper than any performed by the aircraft before, provoked a collective gasp and then cheers from the crowd as the huge jet powered through the extremely low-level turn. The Vulcan also celebrated its rich British heritage with this awesome formation flyby with the world famous Red Arrows aerobatic team. The incredible story of XH558 will not be forgotten. It is one where people’s passion overcame great odds. As such, the big graceful Vulcan will be sorely missed from the skies over the UK. Then again, the aircraft has come back from the brink to fly again multiple times. Maybe, just mayb,e XH558 will soar again.